Posted by Jane in Information on May 27, 2014 . As there are a large variety of wall decors for you to buy nowadays, it is really necessary to get a whole knowledge of what this new home decoration is and how to choose it so that your house will be perfectly decorated. And now, if you are just reading this post and have some interest in refitting your room, this post is going to provide all the information you should know before buy a wall sticker. First, I would love to introduce what wall stickers are. They are one of the most popular interior wall decors in recent years for its easy installation, little investment and different varieties. 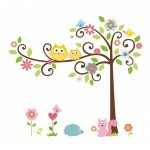 Unlike many other traditional wall papers, this emerging wall stickers are easy to install. “Just peel and stick”, that’s it! Yes, you did not hear it wrong. I really mean peel and stick. There is no need to employ some tools like adhesive tapes or glues. Just peel off the back cover of the sticker and then stick it onto wherever you want to put it up. But please do not forget to clean the surface first, for the particles on the surface will cause some bubbles under the stickers on the walls. They are easy, self-adhesive and even removable. For traditional wall papers, they will more or less do some harm to your walls after being removed. While, our wall stickers will leave no residues even removed aways for years. If your walls are much older, there is no worry. Just use a hair drier to blow the surface of the sticker pasted on the wall, and then slightly remove it off. That’s also very simple. 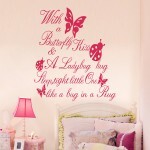 And that is why wall stickers are becoming more and more welcomed in recent times. What’s more, this innovative interior decoration is boosting a large variety of patterns and styles for all sorts of customers. You may shop by rooms and we are providing wall decals for your house rooms like living room, bedroom, kitchen and bathroom; and for some specific places like offices, hospitals, schools or some public places. 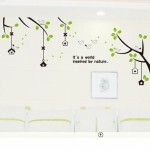 Also, you are able to get what you want according to the types of the wall decals, like animals, trees & flowers, music & sports, modern & retro, nursery wall decals, etc. 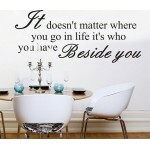 What should be highlighted is our best sellers, quote wall decals and photo frame wall stickers. People are always fond of something that will encourage them or make them feel warm when they are facing challenges or difficulties in life. That’s what exactly our quote wall decals will offer. If you just come across and stay for a while, I think it will be your loss if you close this webpage without picking up a favorite wall decal for your family rooms. 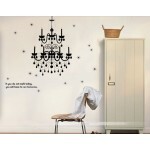 If you still have some problems about our wall decals, just free feel to contact us. Our customer service is always as great as our products and you will enjoy this purchase. 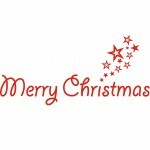 Kind wishes! Posted by Duo in wall stickers decoration on Feb 07, 2014 . Posted by Duo in wall stickers decoration on Jan 08, 2014 .